the sticker on an apple. at all. She didn’t have to. 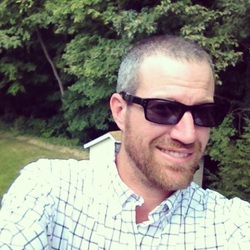 Jay Robinson teaches Creative Writing and English Composition at The University of Akron and Ashland University. He's Co-Editor-in-Chief/Reviews Editor of Barn Owl Review and Associate Editor of the Akron Series in Poetics. Poems have appeared in Anti-, The Laurel Review, The North American Review, among others. Prose has appeared in Poetry and Whiskey Island.